Clothing/Jewelry Description A red long-sleeved plaid flannel work shirt, faded jeans, new gray sneakers with velcro fastenings, and a watch with a black band. Distinguishing Characteristics Caucasian female. Brown hair, brown eyes. Sherry has a two-inch scar on her abodmen and a wide one-inch scar on her upper back near her shoulder. She had a mixture of baby and permanent teeth at the time of her 1984 disappearance, and fillings in two teeth. Her nickname is Little Farmer. 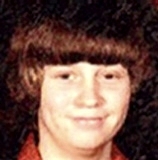 Sherry's hair was longer than shoulder-length at the time of her disappearance. Sherry was last seen at approximately 9:30 a.m. on June 6, 1984 in downtown Greenville, Alabama. She and her stepfather were at the First National Bank and he gave her a dollar to buy a soda. Sherry left the bank and was last seen crossing the street towards the Chevron gas station. When her stepfather returned to his pickup truck fifteen minutes later, Sherry was nowhere to be found. Investigators got information that Sherry may have been in the St. Stephen, Alabama area, near Betaw Road, later that month. There were three reported sightings of Sherry by three different people after her disappearance. Each time, she was accompanied by a man, described as about 50 years old and 5'8 tall with a husky build, a weathered complexion and crow's feet around his eyes. One witness who saw her at a truck stop in Conley, Georgia said Sherry called the man B.J. All three of the witnesses stated that Sherry was noticeably upset, disheveled and appeared dazed. The last sighting was in a mall in New Orleans, Louisiana later in 1984. None of the sightings were confirmed. Sherry is described as a tomboy who enjoyed farm work in 1984 and knew how to drive a tractor. Her mother does not believe she ran away; she had been looking forward to watching her favorite television show and visiting her grandmother on the day of her disappearance, and she didn't have any significant problems in her life. Her case remains unsolved and is classified as a non-family abduction. Updated 8 times since October 12, 2004. Last updated August 29, 2018; details of disappearance updated.